Best TV Antenna Reviews – If you are in a challenging environment as far as television signal reception is concerned then the ANT751R outdoor tv antenna is suited for you. It has superior quality reception including local HD and DTV broadcast signal free of charge. It not only supports digital frequencies but also analog VHF and UHF signals not to mention 1080. 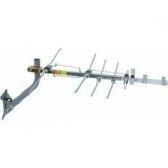 This makes it the most advanced antenna for better-quality reception.